Signing for a princess. Photo by Del Rey. 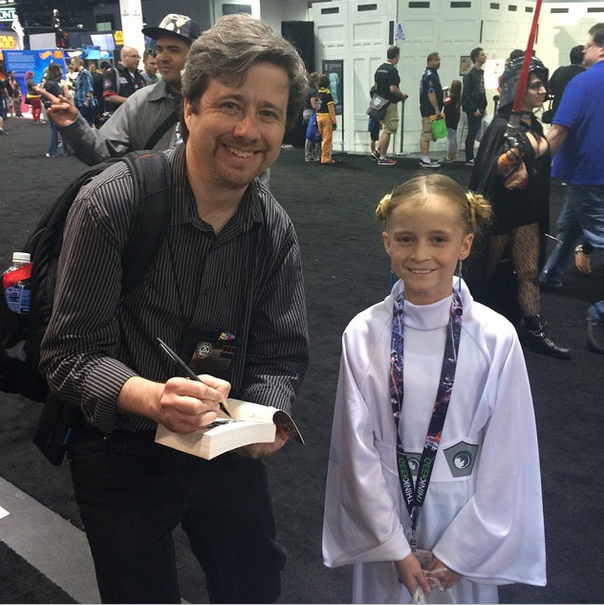 Back from Star Wars Celebration Anaheim, my fourth one of these events and the best yet, in my estimation. I'm thankful to the team at Random House/Del Rey, Lucasfilm, and the event organizers for making it a great experience for me. While the release of the Star Wars: The Force Awakens trailer was naturally and quite deservedly the big news of the first day — we were all standing in the exhibitor room watching the live event on the big screen above the Lego booth! 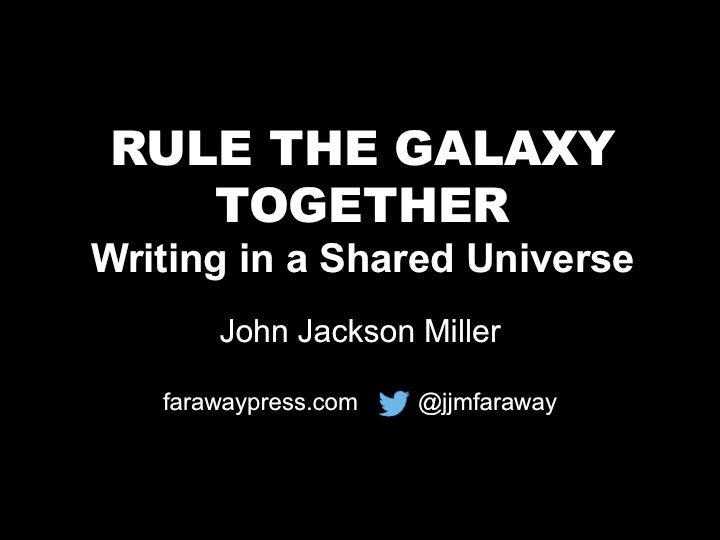 — I had a fun personal first, doing a seminar on how best to write stories within shared universes. I've done many panels on writing, but never any really on my own, with a program, before, so it was a bit of a novel experience, no pun intended. If you weren't able to catch the seminar, you can find an audio recording of it on Tosche Station. It was a fun topic and one I may return to at greater length at some time in the future if enough people are interested. 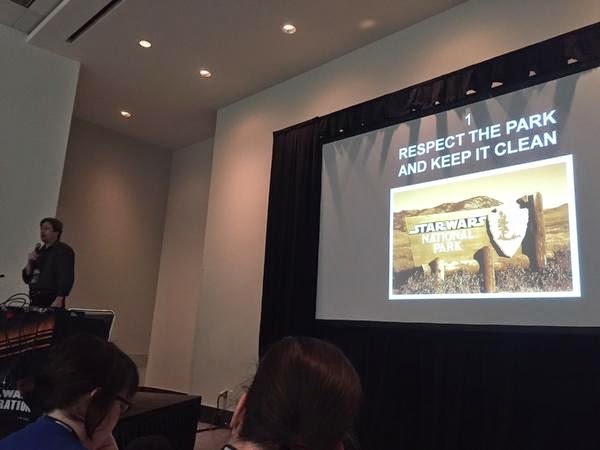 I spoke on the Del Rey panel on Saturday, along with Alan Dean Foster, Christie Golden, Jennifer Heddle, James Luceno, and Shelly Shapiro. We announced there the Rise of the Empire collection, a unique volume which brings together James' Tarkin novel and my New Dawn novel, along with some new short stories connecting them and conveying the spirit of life in the Imperial era. I'm writing one of them. The book is out in October and should catch anyone up who missed the earlier volumes. 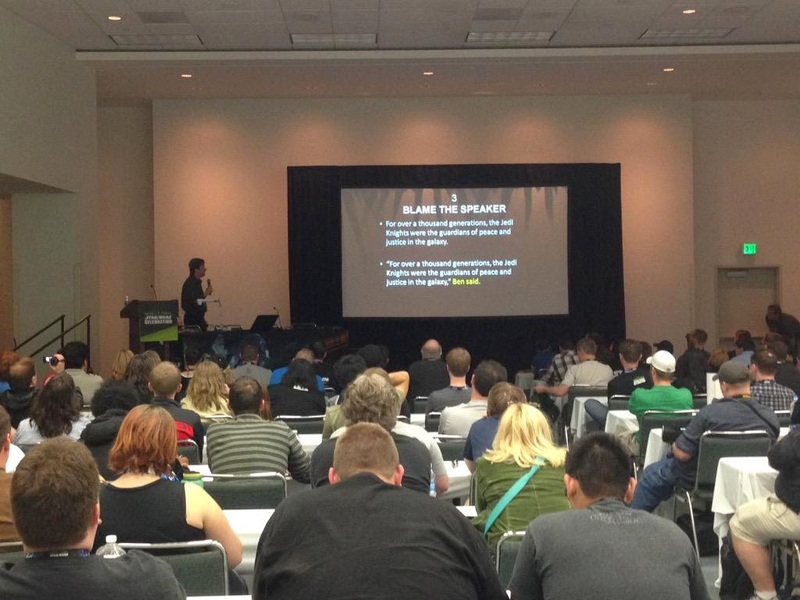 Photo from the live stream. 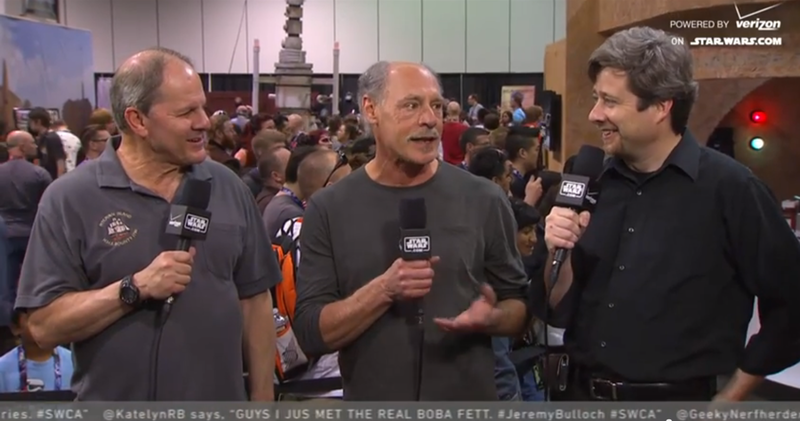 I also got to do an interview with tie-in novel legend Alan Dean Foster, who was announced during the Del Rey panel as the writer of the Star Wars: The Force Awakens adaptation. A perfect choice, neatly paralleling his work on the New Hope adaptation years before. 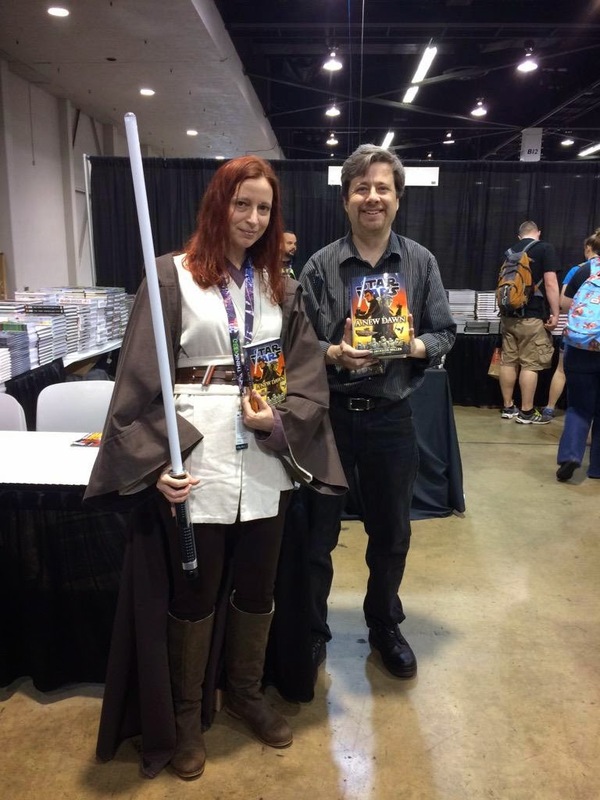 I had met Alan before years ago at Midsouthcon in 1993 — but this time I got the chance to talk with him about some of the many tie-in novels he'd written in the past. The interview with the two of us and James Luceno was live-streamed on Star Wars.com, and it can be seen now here at the 5:34 mark. And then, of course, there were all the great fans and costumers who stopped by to say hi or get pictures taken. 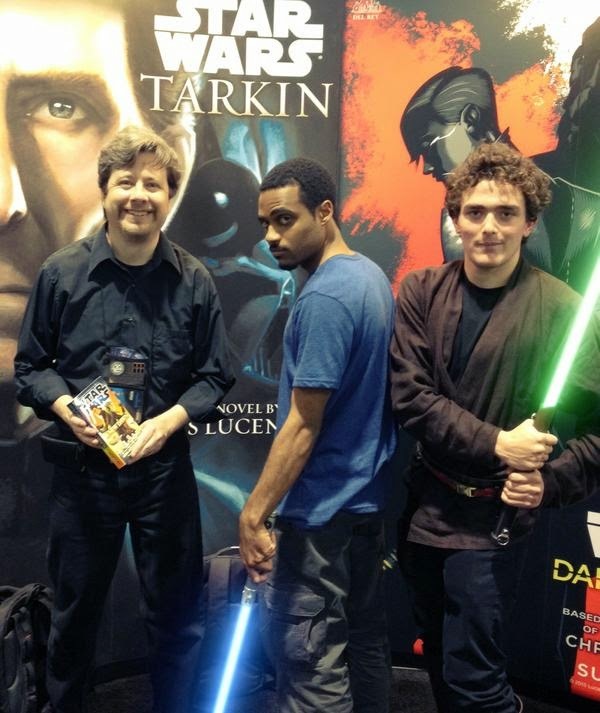 I met not one but three Jaraels this year, as well as two Zaynes, all from the Knights of the Old Republic comics. Again, a great experience. My thanks to everyone who dropped by! On sale today, I have a short story, "Orientation," in the new Star Wars Insider issue, #157, with art by Brian Rood. It's my first story featuring both the Emperor and Darth Vader, and it ties into Paul Kemp's new Lords of the Sith novel. You can get the magazine from your local newsstand, bookstore, or comics shop. Elsewhere, be sure to check out my notes on Star Wars: A New Dawn, posted last week — and, of course, the book, which is now in paperback release. 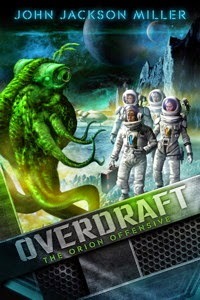 And as a special bonus, for the month of April, my Overdraft: The Orion Offensive book is just $2 for Kindle users! You can also get the latest adventure of Overdraft star Bridget Yang in Apollo's Daughters, which is on sale now. And if you're in Wisconsin, here's another event of note: I'll be at the Fox Cities Book Festival this weekend, speaking at 1:30 at the Appleton Public Library. Thursday, 1:30 p.m. to 2:30 p.m.
• This is my first how-to seminar at any Celebration, and I'm pretty excited about it: I've gathered up a number of pointers from my years of working in tie-in fiction for presentation. Whether you're looking to write tie-ins professionally, writing fan-fiction, or collaborating with other authors on a project for prose, comics, or gaming, these ideas can help you out. I'll touch on things from turning continuity problems into springboards to best practices for preserving future story opportunities for others. Saturday, 12:00 noon to 1 p.m.
Saturday, 2:30 p.m. to 3:30 p.m.
• I'm on this panel about the past and future of Star Wars publishing with Del Rey Editor Shelly Shapiro, Lucasfilm Sr. Editor Jen Heddle, and authors Jim Luceno and Christie Golden. There are other events coming together, I expect; keep an eye on my Twitter account for details. I'm @jjmfaraway. As I know more, I will do my best to post there. 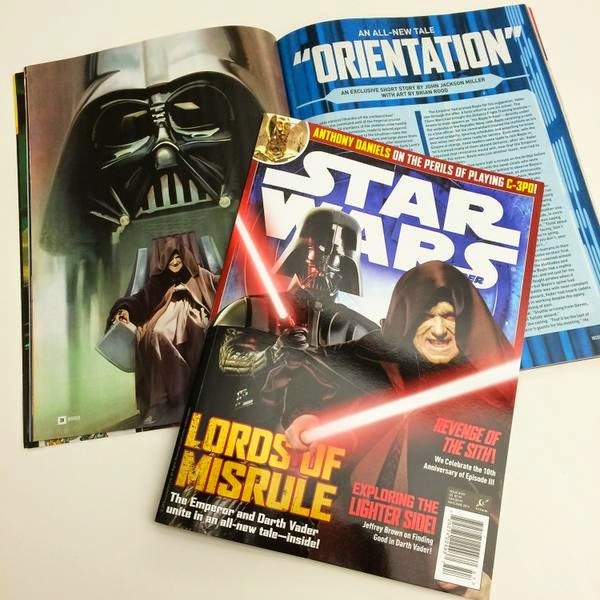 Some more fun: I have a short story, "Orientation," in the new Star Wars Insider issue, #157, with art by Brian Rood. It's my first story featuring both the Emperor and Darth Vader, and it ties into Paul Kemp's new Lords of the Sith novel. Be sure to check it out; the magazine goes on sale April 21. You can get the magazine from your local newsstand, bookstore, or comics shop.